Dr Yu Zhu has recently been commissioned by the Economics Network of the Higher Education Academy to update statistics about earnings premia for various degree subjects from an earlier School for Education and Skills (DfES) Research Report, “The Return to Education Evidence from the Labour Force Survey” (Ian Walker and Yu Zhu, 2001). The study uses data drawn from the UK Quarterly Labour Force Survey (QLFS) between 1994 and 2006 to compare the earnings of all employees in England and Wales aged between 25-59 who have a first (bachelor) degree together with those that left school with at least two Advanced-level qualifications (the minimum qualifications required for admission to a UK university). The sample contains over 60,000 individuals, of which almost 900 are economists. The private returns to each degree subject are calculated as the average percentage premium that graduates earned over those employees without a degree but with at least two or more A-levels. 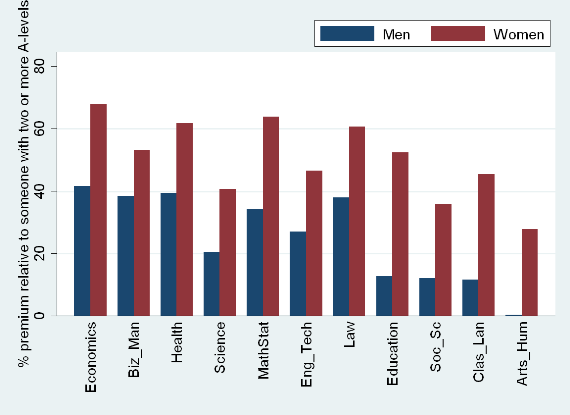 The graph below summaries the main findings and reveals that economics graduates enjoy the highest earnings premia among all graduates, at 42% for men and 68% for women respectively. This research builds upon previous research using the 1993-1999 QLFS and indicates that economists skills continue to be valued highly in the work place.